BSX Digital Music presents the original soundtrack to ZULU DAWN, featuring music composed by Elmer Bernstein (THE MAGNIFICENT SEVEN, THE GREAT ESCAPE, TO KILL A MOCKINGBIRD, FAR FROM HEAVEN) for the 1979 historical epic directed by Douglas Hickox (BRANNIGAN, THEATRE OF BLOOD, THE MASTER OF BALLANTRAE), featuring an all-star cast including Burt Lancaster, Peter O’Toole, Simon Ward, Denholm Elliot, Peter Vaughan, Nigel Davenport, John Mills, Freddie Jones, Ken Gampu and Bob Hoskins. In 1964 the British film ZULU was released, which dramatized the events of the 1879 Anglo-Zulu War in South Africa, during which the Zulu nation rebelled against the incursion of British colonialism. Directed by writer-director Cy Enfield and starring Stanley Baker and Michael Caine (in his first starring role), ZULU portrayed the events occurring between the colonial British Army and the African Zulu warriors during the Battle of Rorke’s Drift, where 150 British soldiers, many sick and wounded, successfully held off a siege by an army of 4000 Zulu warriors. The event that preceded the bloody conflict at Rorke’s Drift, which happened earlier that same day, was the bloody battle on the base of Mount Isandlwana, which is cited in Richard Burton’s reading of Lord Chelmsford’s telegram at the beginning of ZULU. In that battle, the first major encounter of the war between Zulu warriors and British troops, a massive Zulu force of 20,000 warriors attacked and destroyed 1,800 British, colonial, and native soldiers. This event, considered to be the worst defeat ever inflicted on a modern army by a technologically inferior indigenous force, occurred off-screen in ZULU. This film is meant to serve as a prequel to the earlier film. With a noticeably larger budget than the 1964 picture, ZULU DAWN is a widescreen spectacle, with massive battle scenes and huge, panoramic vistas beautifully photographed by Iraqi-born cinematographer Ousami Rawi, who had shot SKY RIDERS for Hickox, Michael Caine’s THE BLACK WINDMILL for Don Siegel, THE HUMAN FACTOR for Edward Dmytryk, and would go on to win an Emmy for his work in the TV series THE TUDORS in 2007. He filmed ZULU DAWN on location at or near the actual places where the events took place 100 years earlier. 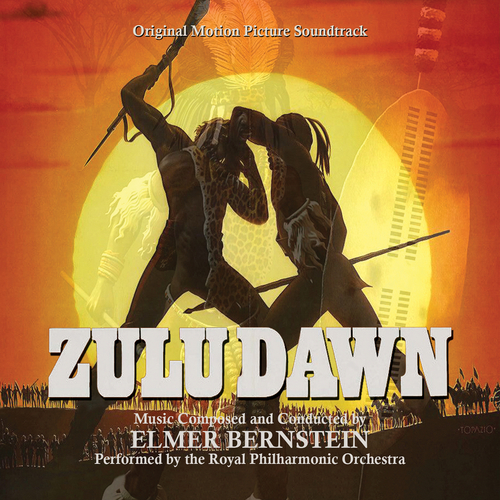 Respected composer Elmer Bernstein was brought in to give ZULU DAWN its musical scope and thunder. Bernstein’s pedigree at this kind of epic blockbusters included historical adventures like THE TEN COMMANDMENTS (1965) and THE BUCCANEER (1958), THE MAGNIFICENT SEVEN movies and nearly a dozen John Wayne Westerns throughout the ‘60s and early 1970s. By 1979 he was just about to embark on his comedy phase, having scored ANIMAL HOUSE the year before and would soon score MEATBALLS, AIRPLANE!, and STRIPES, in the coming years. ZULU DAWN would give him one of his last opportunities to write the kind of broad, large-form action-adventure orchestral score that he’d once excelled at earlier in his career. Previously released on compact disc by Cerberus Records and La-La Land Records and long sold out, BSX Digital Music presents ZULU DAWN for digital download. Music composed by the great Elmer Bernstein, performed by the Royal Philharmonic Orchestra in London, with a new mastering by James Nelson of Digital Outland, new liner notes by noted author Randall Larson and new digital booklet designed by Mark Banning. This release has been officially licensed from Cerberus Records.